← Happy 450th Birthday to William Shakespeare! Dr Mark Nixon has been the inspiration behind the first new Samuel Beckett text to be published in almost 20 years. 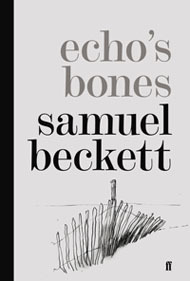 Dr Mark Nixon, one of the world’s leading Beckett scholars, has brought to life ‘Echo’s Bones’ 80 years after it was written. The text was commissioned as the final piece for Beckett’s early collection of interrelated stories More Pricks Than Kicks. However the story was rejected as ‘a nightmare’ by Beckett’s editor and was held back from inclusion in the published volume. Dr Nixon, Director of the Beckett International Foundation and a reader in modern literature at the University of Reading, edited the new volume and wrote its introduction. John Banville in the New Statesman: “This volume is a masterpiece of scholarship”. This entry was posted in Department of English Literature news and events and tagged Beckett International Foundation, Department of English, Department of English Literature, Dr Mark Nixon, Echo's Bones, English Department, English Literature, Reading, Samuel Beckett, University of Reading. Bookmark the permalink.